Eggs Benedict is my favorite breakfast menu item, and it’s super easy to make from home! It starts with a toasted english muffin, topped with a slice or two of Canadian bacon, a poached egg, and smothered in traditional Eggs Benedict sauce, called hollandaise sauce. Most of the time when we eat out at a restaurant my husband could never guess what I’ll order because I mix it up so often. The exception is when we go somewhere for breakfast or brunch, I always order Eggs Benedict. There’s never something on the menu that could tempt me more! Traditional Eggs Benedict is obviously a classic, but I love different variations of it too, like Eggs Benedict with asparagus. 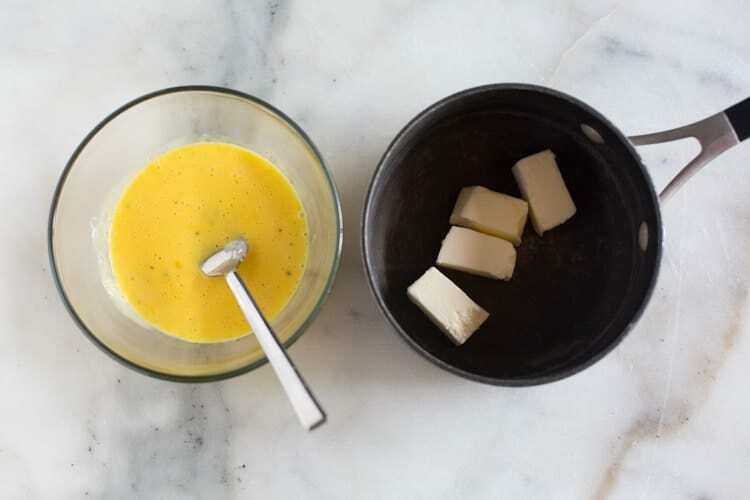 Start by making this simple recipe for hollandaise sauce (see the step-by-step photos, below). Next, poach the eggs, warm the Canadian bacon, and toast the english muffin. 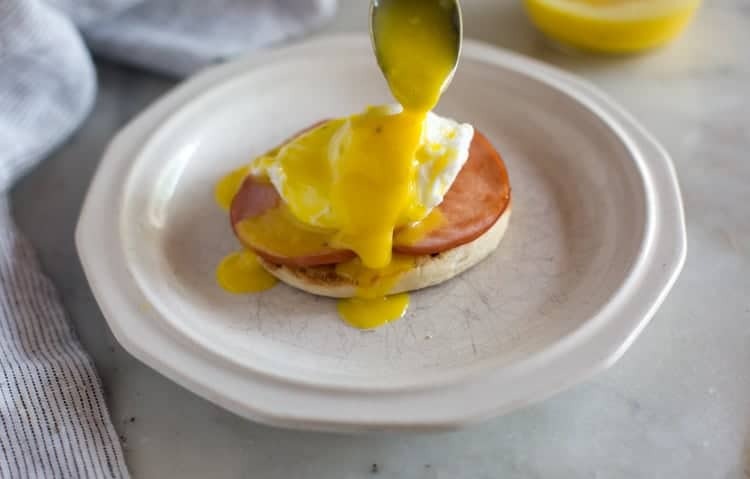 Finally, assemble your Eggs Benedict by placing the Canadian bacon on top of half of an english muffin. 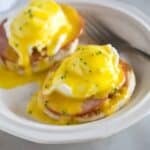 Place a poached egg on top of the Canadian bacon, and smother the egg in hollandaise sauce. For a healthier Eggs Benedict, consider trying eggs florentine! 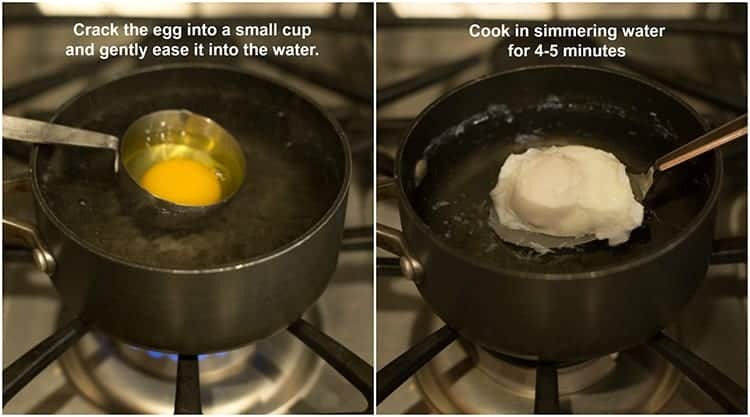 To poach an egg, first fill the pot with about 3 inches of water. 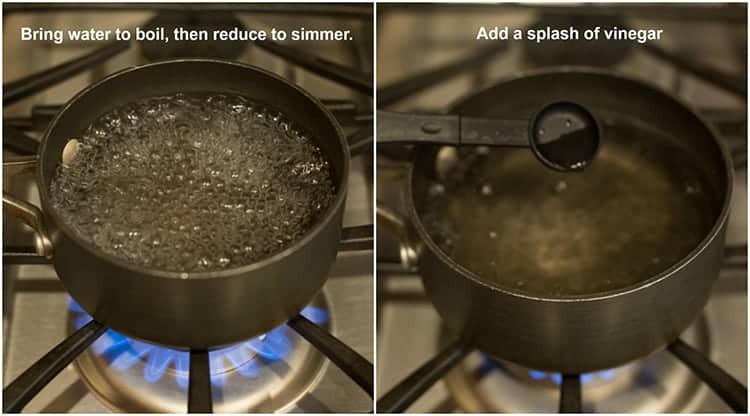 Bring the water to a boil and then reduce heat until it reaches a simmer. You should see small bubbles coming to the surface but not rolling. Add a little splash of vinegar to the water (this is optional, but it helps the egg white to stay together once it is in the water). Crack one egg into a small cup (I use a measuring cup). Lower the egg into the simmer water, gently easing it out of the cup. How long should you cook your poached egg? Cook the egg in simmering water for 3-5 minutes, depending on how soft you want your egg yolk. Remove the poached egg with a slotted spoon. 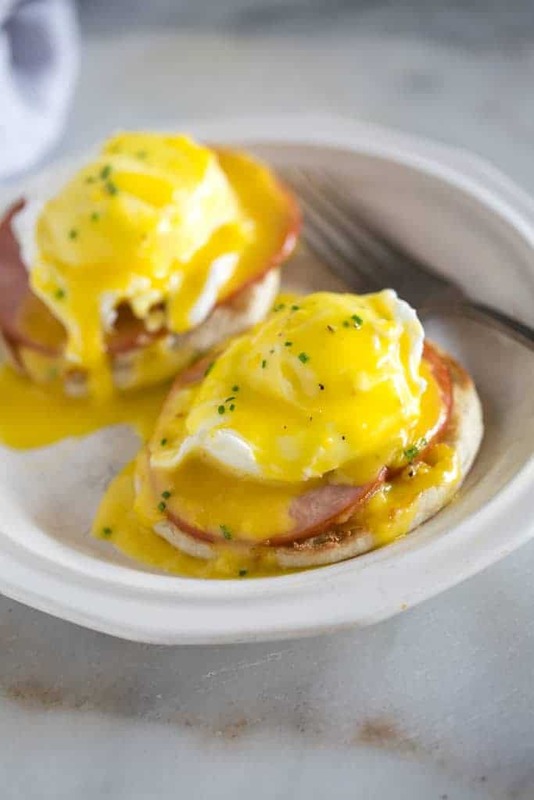 This traditional Eggs Benedict sauce is called hollandaise sauce. Many people buy hollandaise sauce in a packet that just has you add water….I’ll never understand WHY?! It’s SO easy to make homemade hollandaise sauce and it definitely tastes better from scratch! 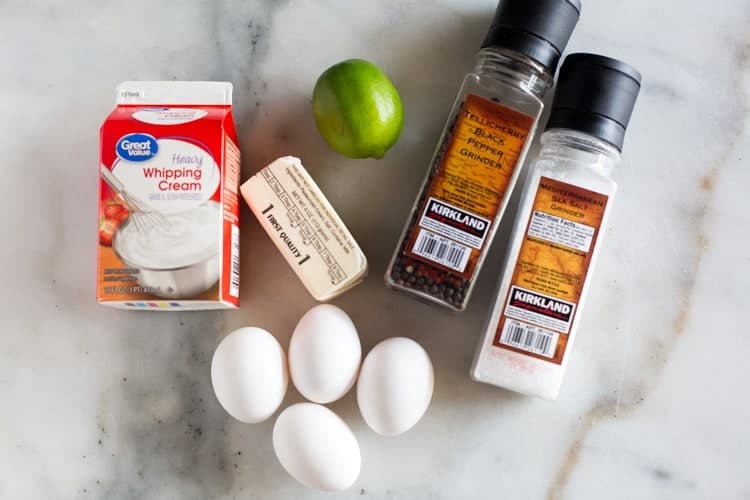 The ingredients for Hollandaise sauce are butter, egg yolks, lime juice, heavy cream, and salt and pepper. 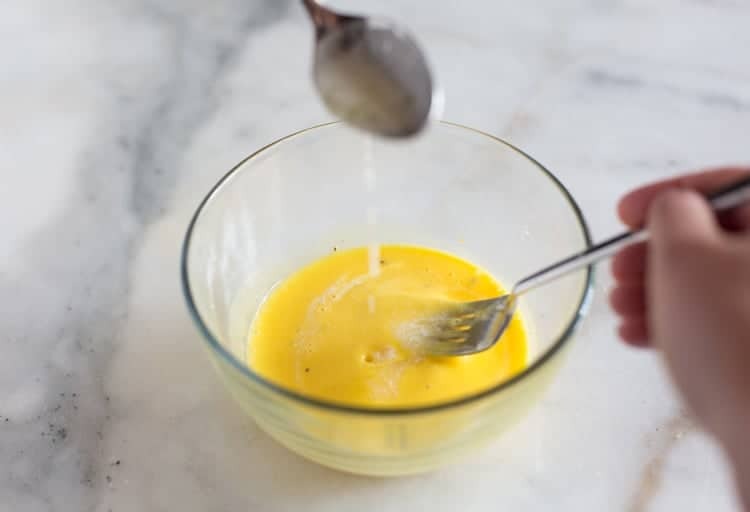 The method I’m sharing is a more traditional method for making hollandaise sauce. Some people prefer to make hollandaise sauce in the blender, which would work well for this recipe. To make hollandaise sauce, start by melting butter in a saucepan. Meanwhile, beat egg yolks in separate bowl and add lime juice, heavy cream, and salt and pepper. Once the butter has melted, you’re ready to temper the eggs by adding a small amount of the hot butter to the egg mixture. Stir it well and repeat this process, slowly adding one spoonful of hot butter to the egg mixture. We do this to avoid curdling the eggs. Finally, add the mixture back to the saucepan and cook it for a few more seconds. Some people worry about raw eggs in their hollandaise sauce. In this sauce, the eggs are cooked, they are just cooked very slowly to avoid curdling! Cooking the hollandaise allows for a thicker, yummy sauce for your Eggs Benedict. For very best results, Hollandaise sauce is best served fresh, right when you’re ready to eat Eggs Benedict. However, you can make Hollandaise sauce a day ahead of time. Refrigerate is until ready to eat, and then reheat it for about 10-20 seconds in the microwave. Eggs Benedict is my favorite breakfast menu item, and it's super easy to make from home! It starts with a toasted english muffin, topped with a slice or two of Canadian bacon, a poached egg, and smothered in traditional Eggs Benedict sauce, called hollandaise sauce. Melt the butter in a small saucepan. In a separate small bowl, beat the egg yolks. Mix in lime juice, whipping cream, and salt and pepper. Add a small spoonful of the hot melted butter to the egg mixture and stir well. Repeat this process adding a spoonful at a time of hot butter to the egg mixture. ( Adding the butter slowly, a spoonful at a time, will temper the eggs and ensure they don't curdle). Once the butter has been incorporated, pour the mixture back into the saucepan. Cook on low heat, stirring constantly, for just 20-30 seconds. Remove from heat and set aside. Fill a medium size pot with about 3 inches of water. Bring the water to a boil and then reduce heat until it reaches a simmer. You should see small bubbles coming to the surface but not rolling. Add a little splash of vinegar to the water (this is optional, but it helps the egg white to stay together once it is in the water). Cook the egg in simmering water for 3-5 minutes, depending on how soft you want your egg yolk. Remove the poached egg with a slotted spoon. **It is not abnormal for a white foam to form on top of the water when poaching an egg. You can simple skim the foam off of the water with a spoon. While the egg is cooking, place the slices of Canadian bacon in a large pan and cook on medium-high heat for about 1 minute on each side. Toast the English muffin. Top each toasted side with a slice or two of Canadian bacon, and then a poached egg. Top with hollandaise sauce. I originally shared this recipe in August 2013. Updated August 2018. Lemon juice would have been a fine substitute. I’ve never made Eggs Benedict before let alone poached an egg in my life! And I’m 42! Until today…..my husband loves Eggs Benedict- hasn’t had it in years (would order at a restaurant ). I wanted to do something special for New Year’s Day so decided to give this recipe a try. It’s a keeper! Much to my surprise being an Eggs Benedict and egg poacher virgin, everything came out perfectly! My husband was so surprised and impressed! Said it was a home run and it was excellent! I’m so happy!! The hollandaise sauce came out great!! Loved the look on his face when I said it was from scratch and not a packet. Ha! Thank you for sharing this! So glad I found it and was able to execute. PS- I also watched a video on YouTube prior to cooking to learn about poaching an egg for extra guidance. Happy New Year! Blessings for an amazing year! I have half and half cream. Can I substitute it for the whipping cream? Yes you can, the sauce just may not thicken up as much as it does with cream, but I still think it would work great. Today, January 13th, is my brothers birthday. He met an untimely death last year, June 29th, just 7 days after our mother died. Shamus was a chef and taught my sister and I alot. His favorite dish was eggs Benedict. Hed make it at family gatherings and it was always a hit. It turned out amazing and delicious. My super picky fiance gobbled it up! Thank you so much for sharing this recipe! Great recipe. I had to find a substitute for the cream so we opted for a tablespoon of whole milk yogurt and the lemon juice went well with that. Everyone loved it! Will make again. Yes, lime juice is used….what’s your question? Hi Christie, I’m sorry you didn’t like the lime. All traditional hollandaise sauces contain lemon or lime. Next time you could try lemon juice and use less, if you don’t like the flavor. I liked the lime more than the previous lemon juice recipes I’ve tried. Husband likes runny eggs, but I hate that! So, I poached the leftover whites from the sauce yokes, for myself… Win/win @ our Huas ? I heated the liquids (milk, instead of cream) with the butter, then tempered the yokes, and it still turned out fine. Thanks for the photos & great instructions! Made your recipe this morning and it was a hit! The trick with the measuring cup was so helpful— thank you for such a great recipe! Thanks again for sharing such a great recipe my family loved it!